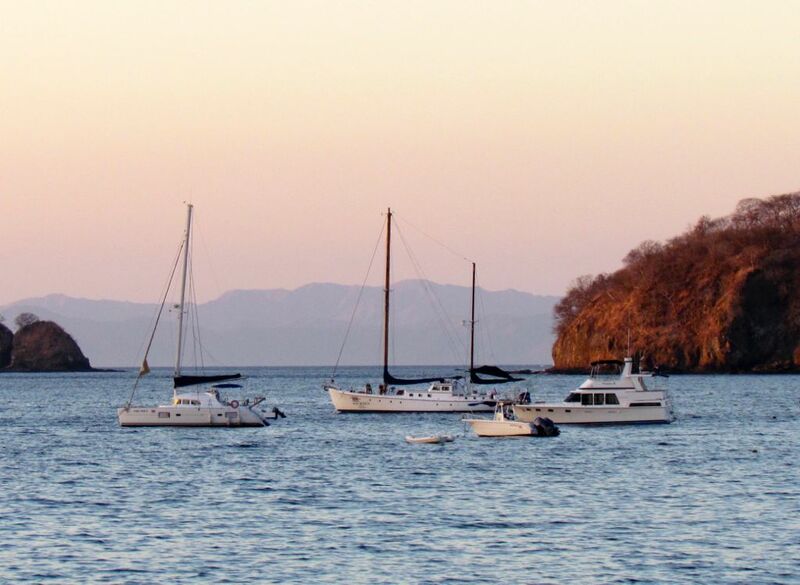 Costa Rica is known for its rich biodiversity and environmental conservation, for us it was a perfect opportunity to get away from our cold Canadian winter and visit with our daughter who was there doing field research. 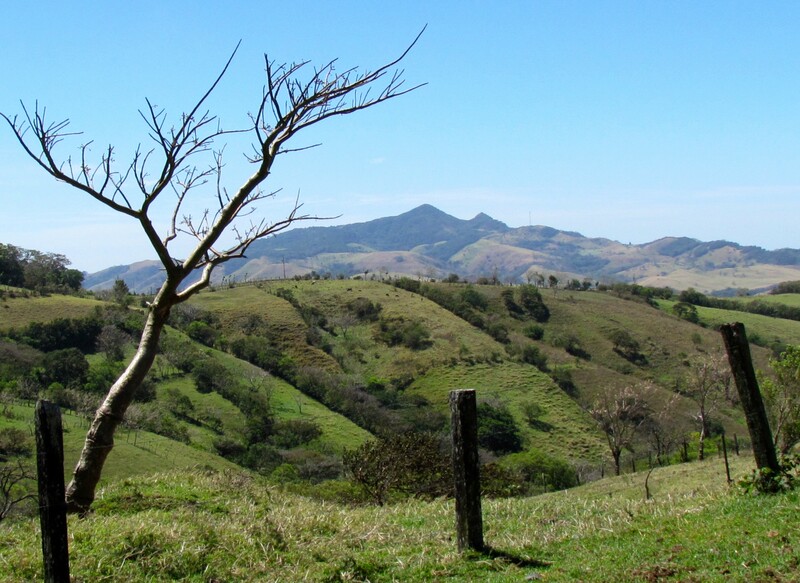 Our seven-day journey began in Liberia, the capital of the northwest province of Guanacaste. Knowing that our flight would arrive late in the evening, we decided to stay at the conveniently located Hilton, the only hotel it seems in close proximity to the airport. There are other options if you wish to take a taxi to Liberia, but since we had to return early the next morning to get a rental car, staying at the airport seemed like the logical choice. Having a fluffy pillow after a long travel day doesn’t hurt either! For our RTW trip, we plan on travelling light, staying in a mix of budget accommodations and using local transport to get around, renting a car seemed to go against the way we envision how we will be travelling, however, wanting to maximize our short time in Costa Rica we decided to rent one. Certainly not a cheap mode of transportation, but certainly convenient. 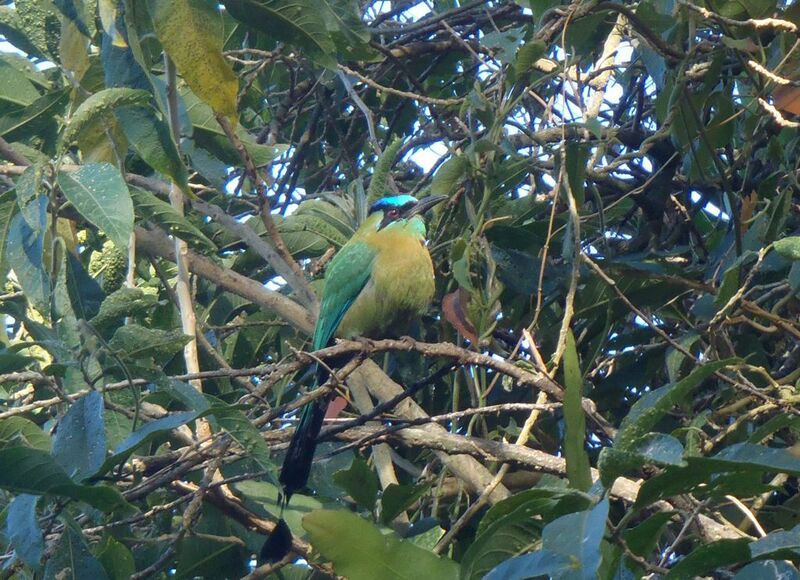 Hubby didn’t think we needed to rent a 4 wheel drive, however, the rental agency insisted on one, once we told them our intentions of visiting the Monteverde region. And are we glad we did! We drove into town where we met up with our daughter for a tipico ‘Gallo-pinto’ breakfast, a local dish of rice and beans. Later we strolled around town taking in the central plaza and all the day-to-day activity of a busy working Costa Rican town. From there we headed south along the Pan-American highway to the dry interior. 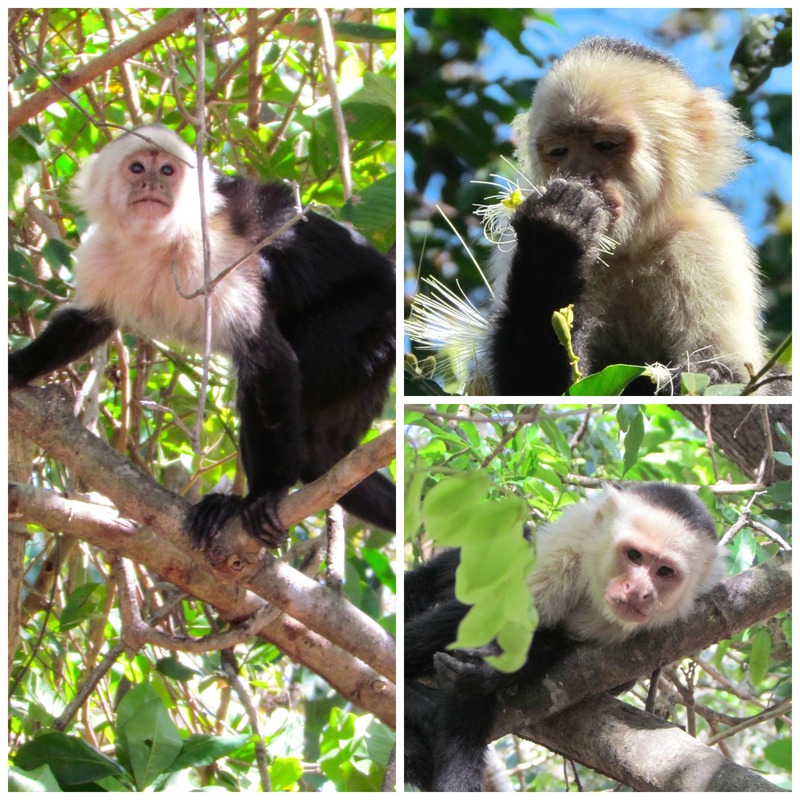 A half-hour ride from Liberia, over bumpy dry volcanic stone roads we arrived at the Lomas de Barbudal Biological Reserve where she was researching white-face capuchin monkeys. 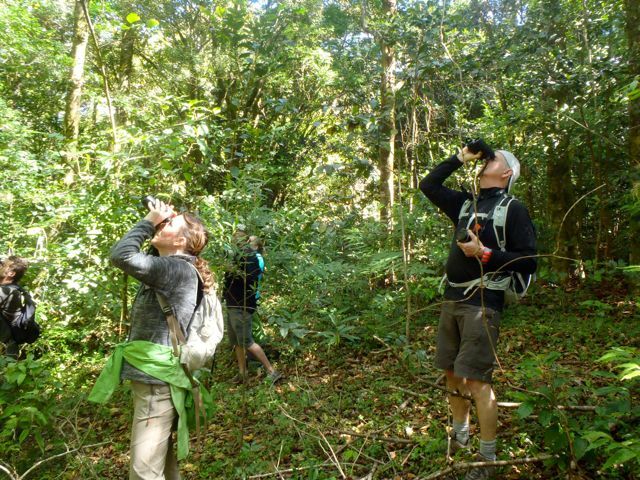 We camped at the reserve and the following day we joined our daughter on a field hike to observe the Capuchins. It was an incredible experience watching the monkeys in their natural habitat as they interacted, fed and scurried around in the trees. Read more about this adventure here. Leaving Lomas Barbudal towards Bagaces, we arrived at the Catarata Llanos de Cortés, a local water pool and waterfall where we enjoyed the afternoon cooling off. This one spot is a little off the beaten path, but not too hard to find and a real treasure. After a short hike down over loose footing, you come to this lovely spot. 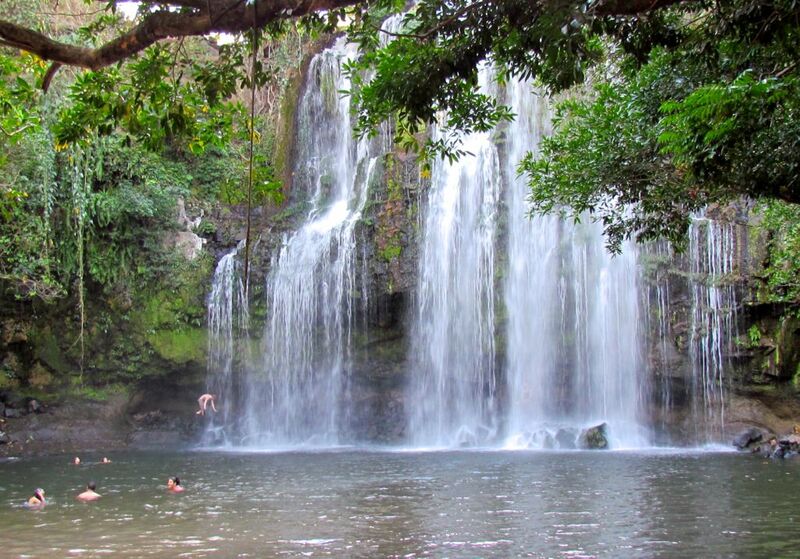 The 40 feet wide waterfall and calm waters irresistibly invite you to swim right up to the fall and walk behind the cascading water. Later, we finished our day with dinner at a local restaurant in Bagaces. On our third day, we (plus our daughter and two of her co-field assistants) departed from the Lomas Barbudal field site mid-morning, the day already heating up like an oven. We drove south along the Pan-American highway to Cañas, where we stopped for another tipico breakfast on the main street. 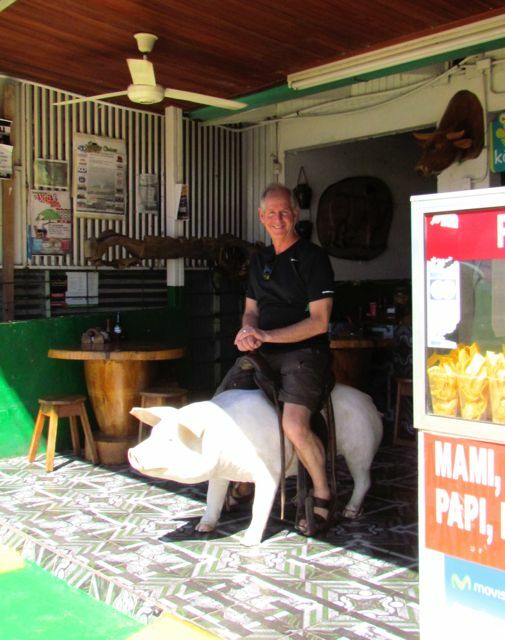 We even took turns sitting on the bucking pig outside the restaurant’s entrance. We continued on, upwards into the foothills. As we gained elevation the landscape become greener. We turned at the town of Tilarán towards the mountains and soon the rough paved roads, turned into rough windy gravel roads. It made for slow going…it was bumpy! 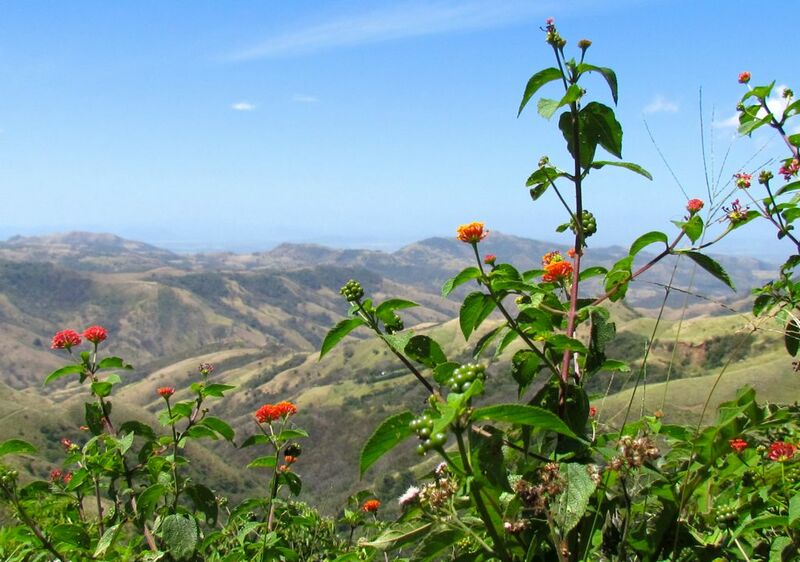 Luckily the road from Tilarán to Monteverde is extremely scenic and makes up for it. 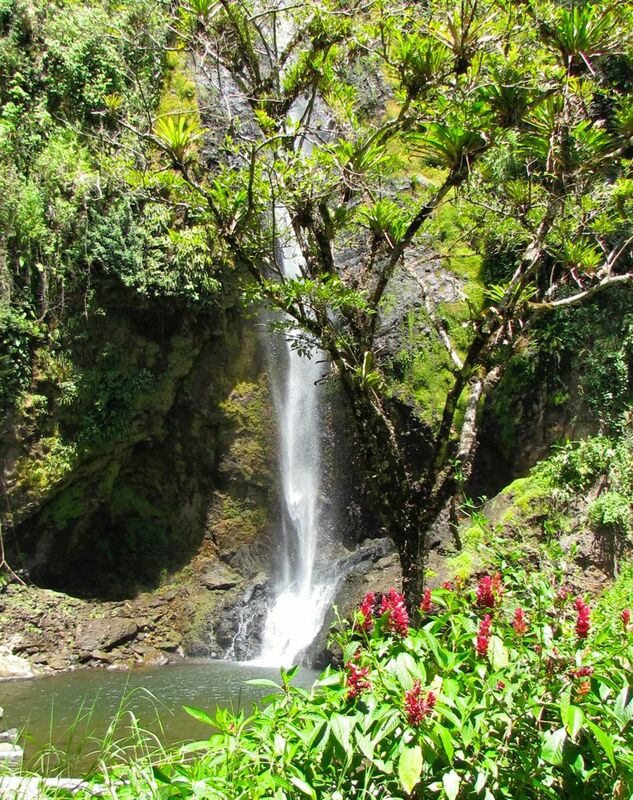 Past Tilarán, along the road to Monteverde we came across ‘Viento Fresco Waterfalls’. “Who’s up for a hike to the falls?”. Everyone jumped in, all too happy for a break from the bumpy ride. From the parking area, the trail leads you down to four different waterfalls. At the bottom, we rested and admired the 100 meter Rainbow Waterfall. Pondering the hike back up in the afternoon heat, we wondered whose idea it had been to hike down. Back on the road, it got progressively worse, it was a bone jarring ride but eventually we reached the village of Santa Elena – and the roads in town were paved! 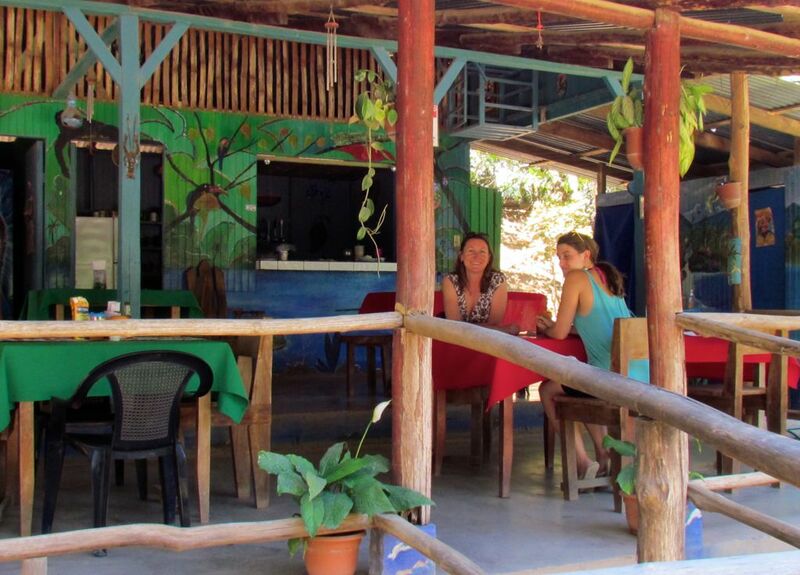 Our accommodation in Santa Elena was at the Cabinas Vista Al Golfo which was centrally located and only a five-minute walk to the center of town. For an affordable price, this hostel has a lot to offer; our private rooms were clean and comfortable, plenty of hammocks, large common rooms, two well-stocked communal kitchens and a large patio with views overlooking the hills. Plus it included a nice simple breakfast. We had originally booked for only one night with the intention of heading towards the beach the next day, but soon realized that we needed to stay another night in order to see and do some of the many local attractions. Santa Elena is very windy, and the air was moist and cool. So do bring a warm fleece and raincoat. We’re not ‘birders’, but an early morning birdwatching tour with a private guide was on the agenda. Our wonderful, knowledgeable guide Frank picked us up at the hostel and toured us around in his van to a variety of locations. He skillfully listened for the birds, identifying what kind they were from their sound and would quickly point us in their direction. 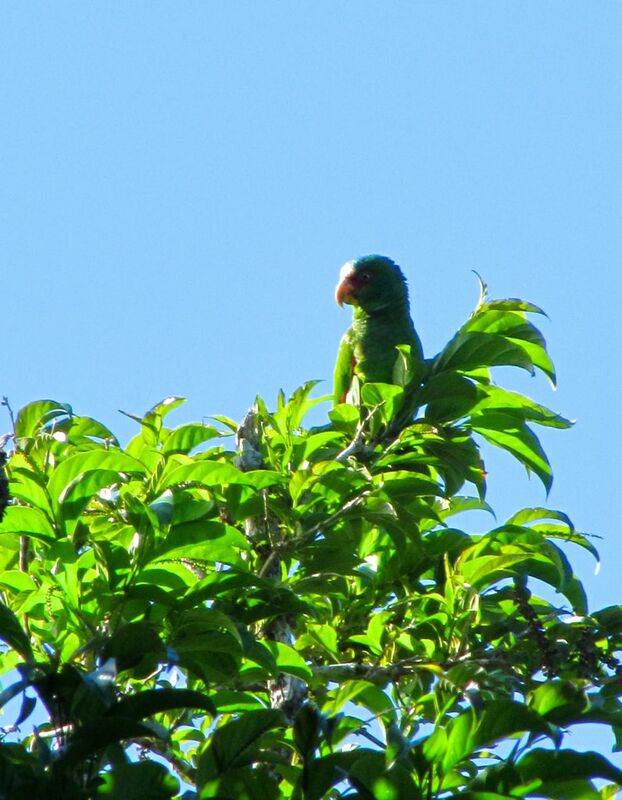 It was impressive how he could spot them in the dense foliage. 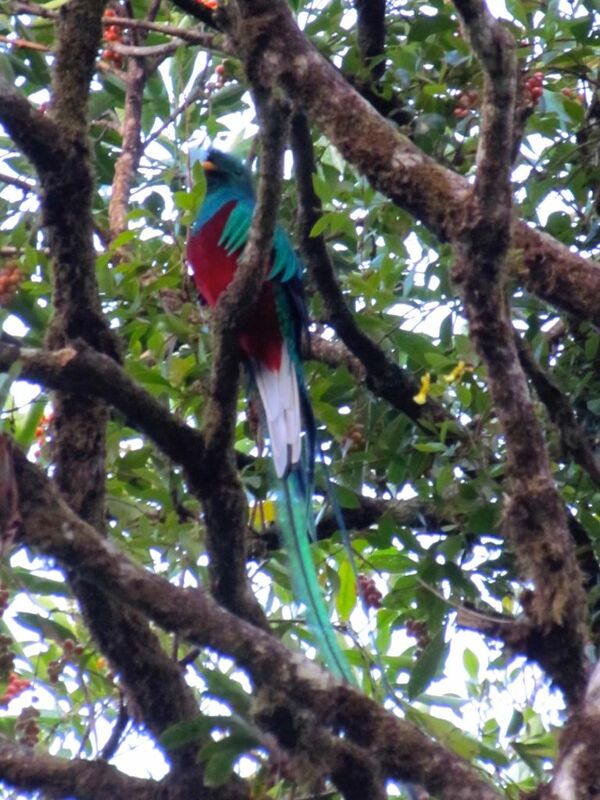 We saw a large number of different birds including the endangered Great Green Macaw, Quetzal, hummingbirds and many other species. Returning from our morning we lunched at Taco Taco, a small shack where you order from a window before enjoying the best burritos and tacos sitting on the outdoor terrace with funky seats made of recycled tires. Our stomachs full, we strolled back to the hostel stopping in and out of the knick-knack tourist stores. After some lounging at the hostel and feeling adventurous, we discovered the excitement of an afternoon spent flying like Superman, zip-lining and taking the plunge at the Tarzan jump. The best adrenaline rush – we still giggle when we think about it! 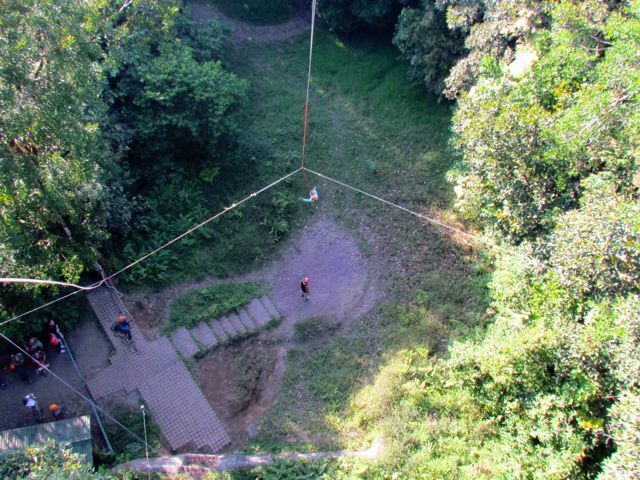 Swinging like Tarzan, 140 feet jump into the unknown. 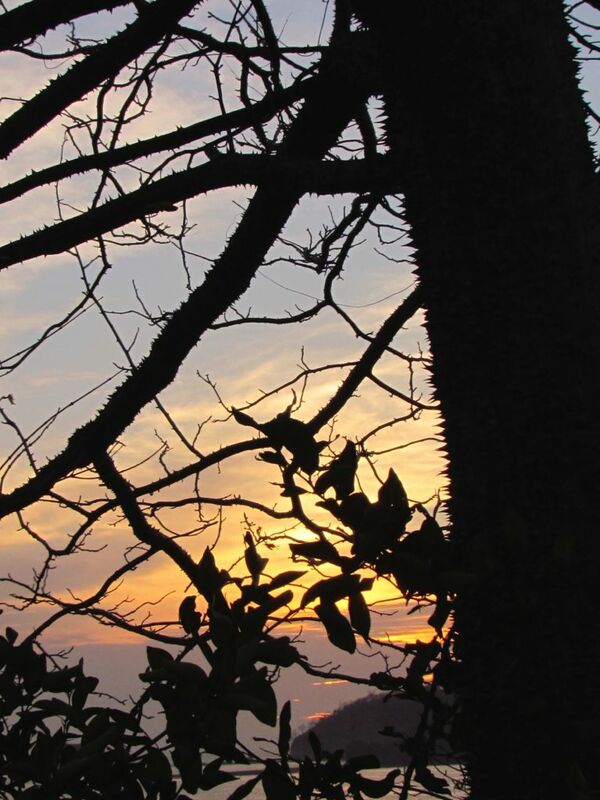 Departing Monteverde for the beach, we drove towards the Nicoya Peninsula. We proceeded south from Santa Elena passing the towns of Guacimal and Sardinal. This route was a bit longer but in much nicer condition than the road in from Tilarán. Reaching the Pan-American highway we turned back north until Limonal, where we turned left following the signs to Nicoya. 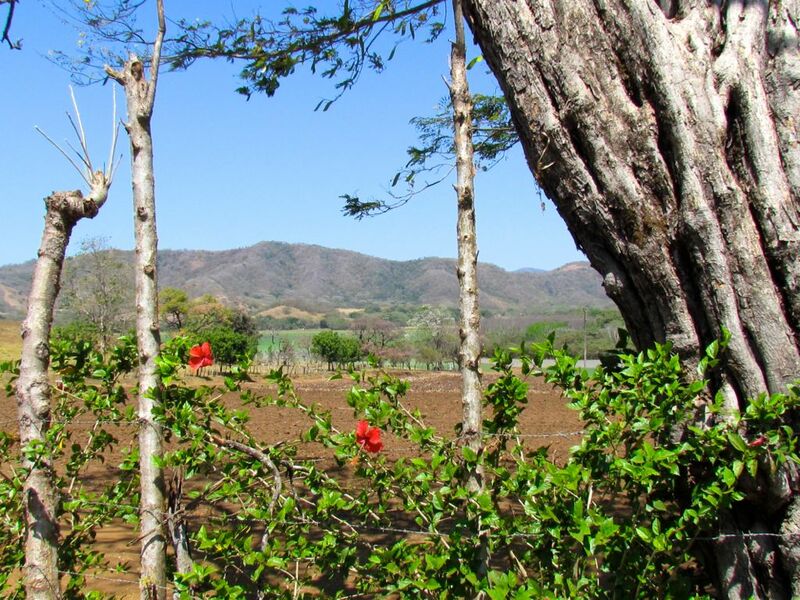 From Nicoya, the route to the ocean winds through the typical Costa Rican countryside. The farmland is frequently planted with living fences which offer both economical and environmental benefits – and so pretty to look at! We found our hotel, Rancho de la Playa and were immediately welcomed. 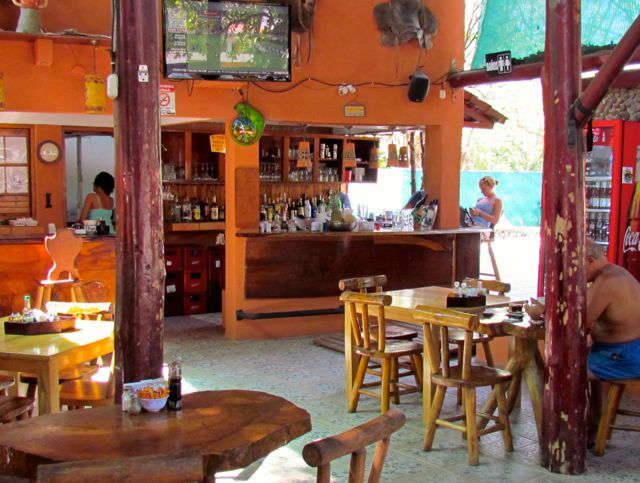 It’s a happy place, small enough that you quickly get to know the friendly multi-lingual staff, a quick two-minute walk to the beach and has a nice little pool by the bar where they will serve you delightful cocktails. Sámara is a charming village with a laid-back vibe. The main street has a range of cafés, restaurants, boutiques and art galleries to keep you busy browsing when you need to get some shade at the peak of the day. Seeking some beach time, Playa Sámara didn’t disappoint. It’s an unspoiled quiet beach, not overly commercialized with a mix of locals, tourists, and roaming horses. A perfect place for some rest and relaxation. 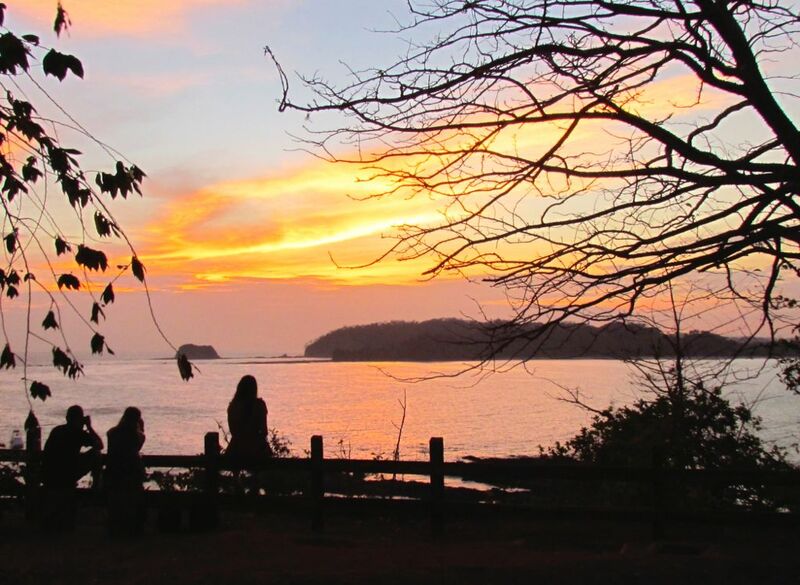 A ten-minute drive south from Sámara to Carillo you can stroll on the beach before taking in the golden sunset view overlooking the bay. 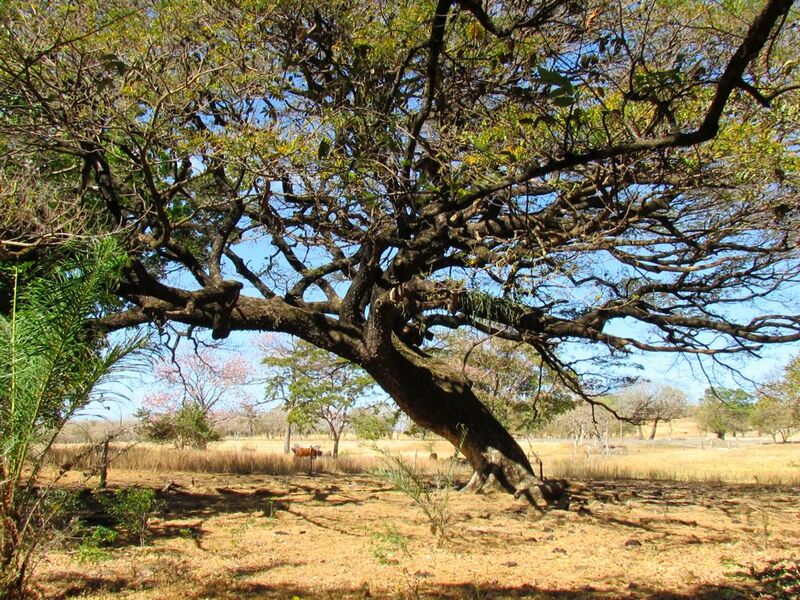 The thorny trees fascinated Ginette, the trunk and branches are all covered with small spikes, we are not sure what kind of tree this is? – something to Google when we get home. 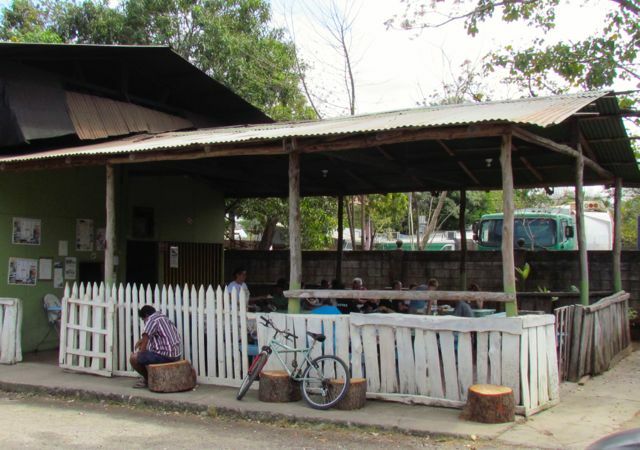 Day trip around Sámara – from our map it seemed that it would be a short drive to the nearby town of Nosara. We headed in that direction, taking turns here and there and suddenly came upon a little river running right across our path. Our daughter got out to check the water level, but it came to her knees so it was quickly decided to turn around. Heading in the other direction, we continued along the back roads exploring, passing small villages developed around the central soccer field and the church. Have we mentioned that we were glad to have rented a 4×4? We came to another river crossing, this one we crossed. 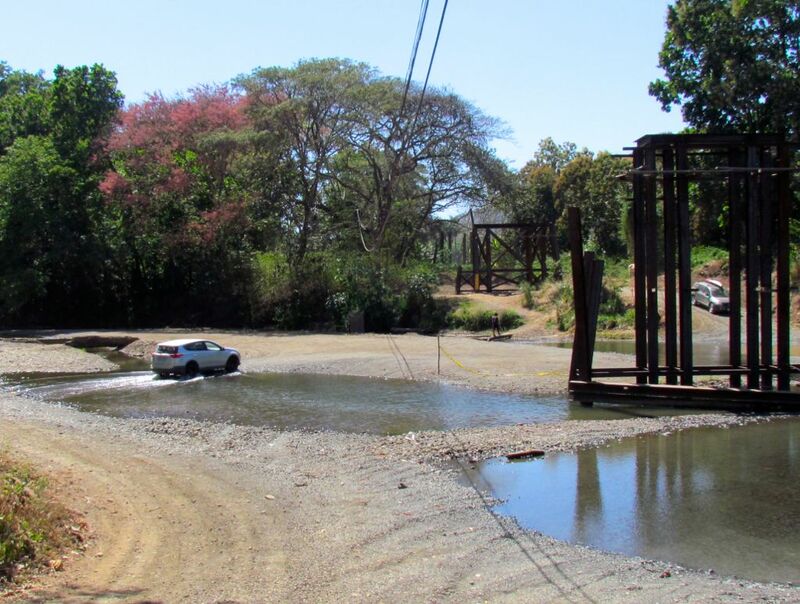 This is the road in the dry season, unpassable in the wet season we imagine. 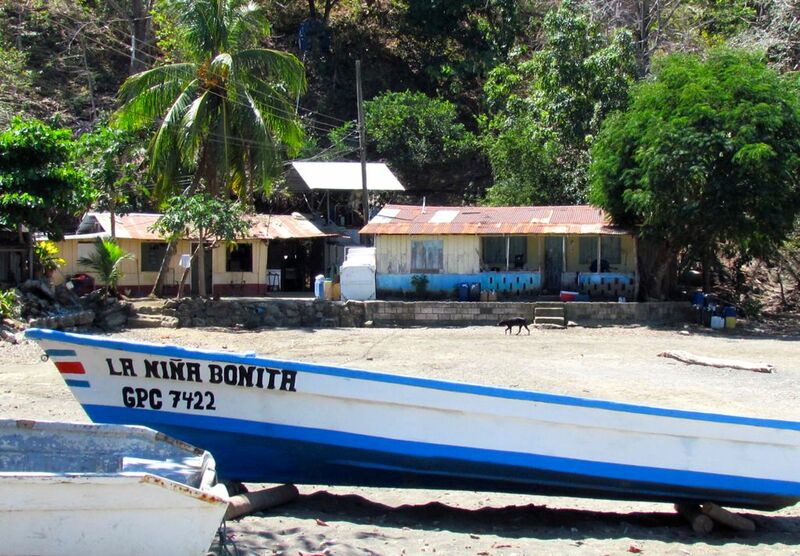 On our last day, returning to Liberia, we looped through Nicoya on to Santa Cruz and back up north along route 21. For lunch, we joined the locals in Santa Cruz, based on a suggestion found in a Fodor’s 2000 Costa Rica travel guide; at a women’s cooperative restaurant called Coopetortillas, it serves “tortillas baked the old-fashioned way – on thick, round plates on an open fire – by chatty women in pink uniforms.” It is one of the few places that still serves traditional Guanacasteco foods. Last drink at sunset at the beach, Playa del Coco, before calling it a night as we had an early morning for our long flight back to Canada. 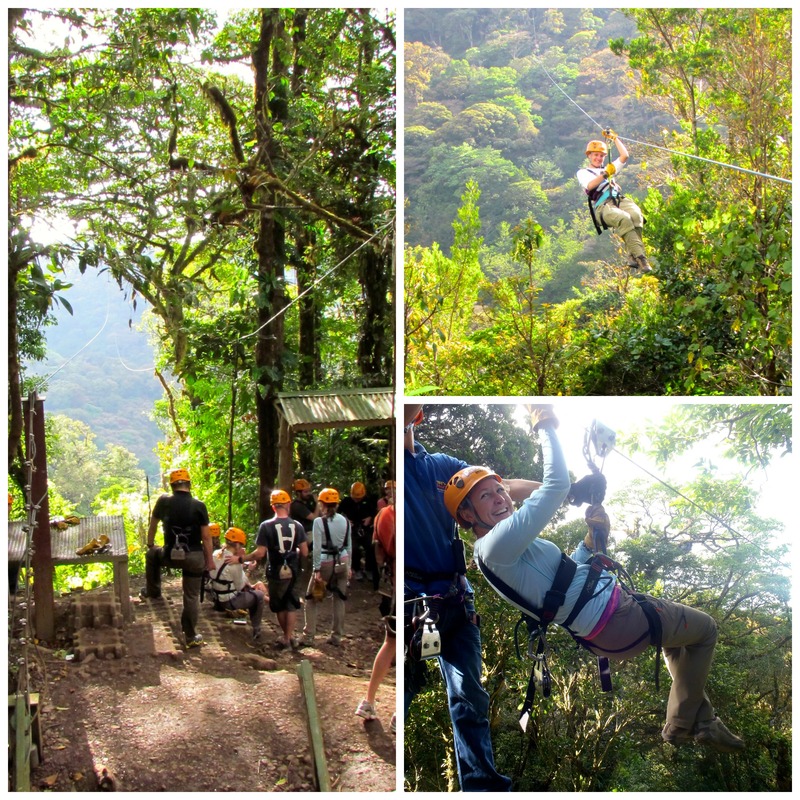 With only a week in Costa Rica, we only saw a fraction of the many sites and attractions the country has to offer. A country rich in diversity of wildlife and flora, numerous national parks, volcanoes, hot springs, fabulous mountain scenery, endangered birds, and sandy beaches. Thank you Maxine, I will make sure to update that.